Dawn Patrol. 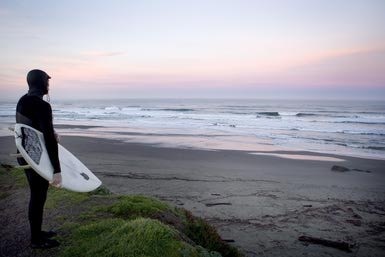 N. The act of getting up extremely early – sometimes before sunrise – to go surfing. Searching for uncrowded waves. You know the drill. Wake up to tapping on my window by my surf buddy, Neal. Dark outside, 4:30 AM. Grab my board and head down to the beach. Riding through the darkness I dream of perfect, wind-kissed, uncrowded waves. It has been flat for a week and everyone is antsy waiting for the next swell. As we get close to the beach we can hear it: waves crashing in the darkness. In the dim light I can barely see the white water off in the distance, feel the warm, light offshore breeze, watch as a dark swell rises out of the shadows and crashes into a perfect left. We scramble for our wetsuits and in minutes we are paddling out just as the sun lightens the horizon to the east. 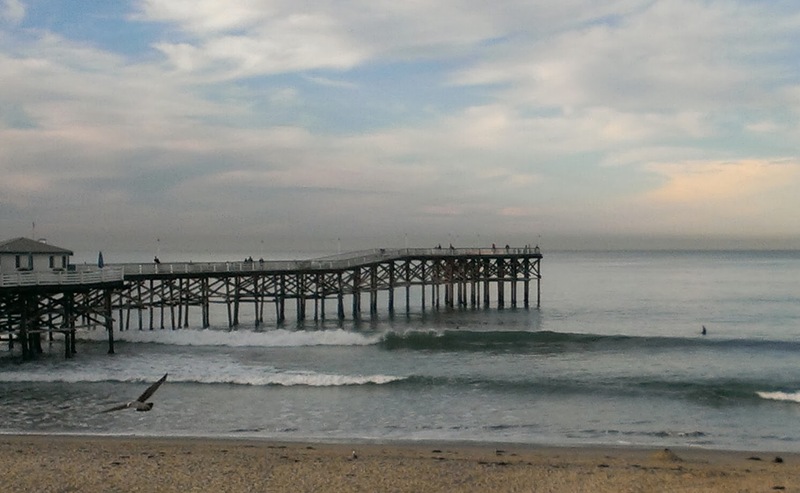 Finally in the lineup we enjoy the perfect south swell: clean 4-6 foot waves rising up into stiff offshore breeze. Just me and my friend. No one else out. An hour later signs of life appear on the beach and others start paddling out. By then we are both tired, done with our morning session. The incoming tide starting to ruin the swell. Another dawn patrol success. We were lucky. We didn’t know that there was a major storm in the Southern Hemisphere churning out waves that we would get days later. Nobody did back then. We were just diligent and determined and ended up in the right place at the right time. The rewards of the dedicated. The early bird gets the worm. The triumph of the dawn patrol. Mother Nature, however, still has the power to render even the most perfectly planned dawn patrol pointless, leaving early risers heavy with caffeine haze and packed with unspent stoke. The ultimate surfing ecology road trip. Combining my interests of surfing and marine biology we set off looking for abalone and good, uncrowded waves. I was starting my PhD dissertation and had set up sites and tagged abalone in northern and southern California. Baja was next. Cruising with my college buddies Paul Dunn and John Steinbeck (yes, related) we picked up Alberto Pombo, our Mexican guide and scientist at CICESE in Ensenada. Together we cruised south: Quatro Casas, San Quintin, Punta Baja. After two days we turned off the road to Bahia Tortugas (Turtle Bay): a long, dirt washboard road — 100 miles to the bay. There were two speeds: 15 MPH, agonizingly slow over the closely spaced washboard bumps; and 50+, flying down the road so the bumps turned into a steady vibration with the van sliding around turns. We chose the latter and spent two hours flying down the “road” until the vibrations pulled parts off the car and we had to fix the radiator with z-spar and strips from our wetsuit. Finally, we rolled into Turtle Bay and (with Alberto’s help) set up camp at a small military base in town with armed guards. 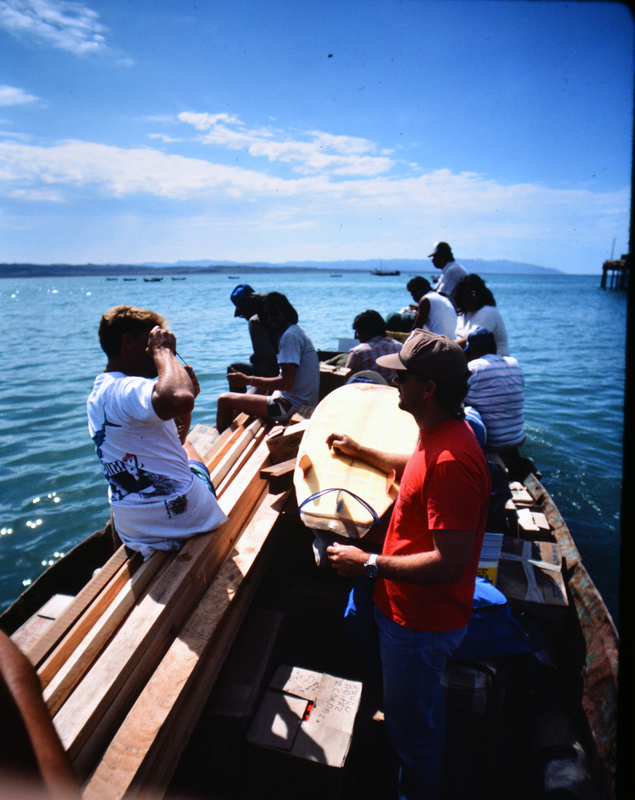 The search for perfect waves: Baja, 1986. From there we learned about the DUKW (the Duck). One of the challenges of getting from shore to a ship is motoring. The Duck is the ultimate amphibious vehicle. So we loaded up our science gear, wetsuits and boards and climbed into the duck on the beach at Bahia Tortugas. Destination: Natividad; a remote offshore island with mythically perfect waves. From the Duck we transferred our gear to a fishing vessel for the 10+ miles ride out to Natividad known for both surfing and abalone. On the Duck, heading out to a fishing vessel for the trip to Natividad. As we motored out we had visions of perfect, uncrowded waves in our heads. After all, we had driven over 1000 miles, including 100 miles on a dirt road, we found the Duck, the fishing vessel, and before us loomed the island of our dreams. As long as I live I’ll never forget what happened next: We saw a jet plane off in the distance. As it grew bigger it was clearly headed for the island. And as we pulled up to the shore we watched it land, the door opened, and one after another a surfer with their board streamed out of the plane. Insta-crowd. Our dreams of uncrowded waves shattered, obliterated in seconds; weeks of effort destroyed in an instant. Money trumps initiative. Gone in an instant were the days of finding uncrowded waves in remote spots. Crushed was the spirit of the dawn patrol. At that moment I felt a deep wave of sadness. That no longer was getting up earlier, driving farther, making that extra effort to find a remote spot a ticket to good waves. Now anyone could do it effortlessly with a few extra dollars. If you had cash you were now entitled to the best waves. If you didn’t? Well, too bad. 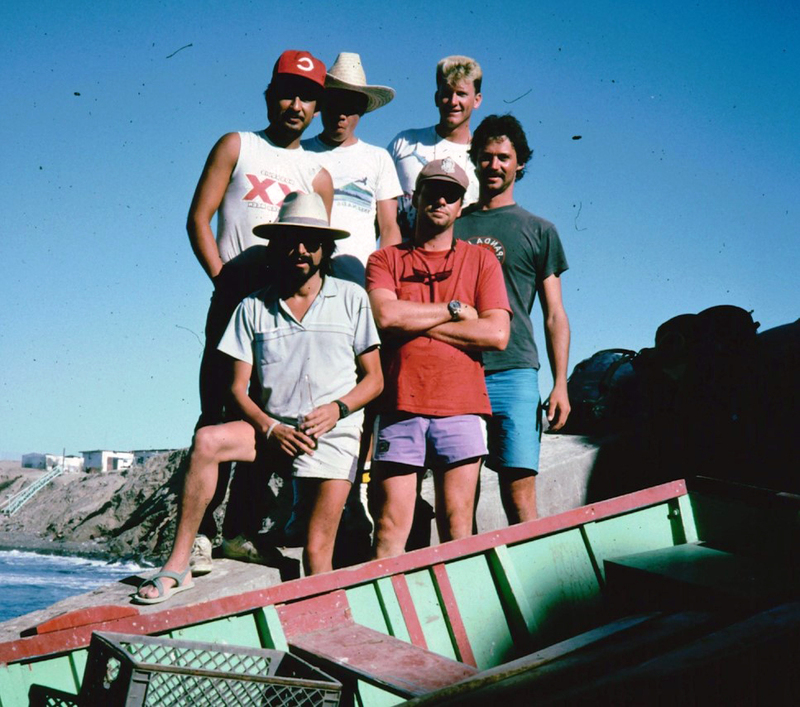 The crew on Natividad, 1986. Front (from left): Alberto Pombo, John Steinbeck, Brian Tissot. Back row (from left): our two locals hosts and Paul Dunn. So where does that leave us? As much as I may not like it those days are gone, forever. Moreover, the continued adoption and use of modern technology by surfers has elevated the “luck” of the dawn patrol to that of a scientific model. Now, due to the efforts of Sean Collins and Surfline, we know days, even weeks, ahead of time when and where the next swell will hit with a high level of certainty. Surfers will now literally fly around the globe to hit rare surf spots with rare swells. Gone are the days of the Endless Summer where surfers stumble upon a Cape St. Francis. Now you pull into a parking lot at dawn only to find it full of cars, everyone alerted to that new south swell days ago through an e-mail. But life moves on so we have to deal with it. On the bright side we now can predict when and where that new swell will hit and are more likely to find good waves, more likely to plan a surf contest under good conditions, less likely to paddle our on a step ladder swell and get caught outside. And what remains are those uncrowded times and unknown places that remain to be discovered even further off the beaten path. So at some level the spirit of the dawn patrol lives on, and probably always will. And as technology and the world continues to evolve at some point, perhaps in a generation or two, we can begin to discover the reefs and waves on the shores of other planets when the concept of the dawn patrol will take on a whole new meaning.